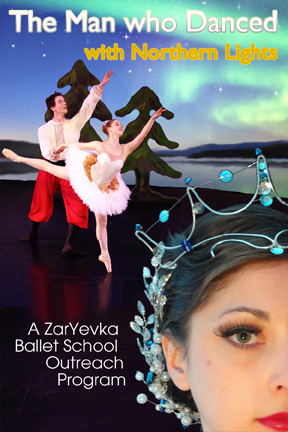 In contribution to anti-bullying awareness, ZarYevka Ballet presents this tale of courage, mistakes, forgiveness, and self-examination. Lewis Carroll’s famed nonsense poem The Jabberwocky is brought to life with life with giant puppets, exciting professional dancing, fabulous costumes, and charming narration. Experiencing this story, students are encouraged to look at how their words and actions may be affecting those around them, perhaps even accidentally. Yukina discovers someone has been spreading rumors about her, and ventures into the forest to discover their origin. Along the way she meets the Bandersnatch, the Jubjub Bird, and learns much about the nature of rumors, gossip, and the telephone effect. Could Yukina have been feeding the Jabberwocky and causing problems herself? The story is engagingly narrated throughout. Students and teachers alike will be delighted by this heart-warming tale in which Yukina learns that part of growing up is taking responsibility for the things we say. "The Fish & The Bird: A Fantastic Fable"
ZarYevka Ballet furthers the anti-bullying dialogue with a powerful story of two very different individuals finding common ground. The story is shared with beautiful scenery and costumes, giant puppets, and exciting professional dancing. In the Tulgy Wood, birds live in the trees while the fish stay in the stream. Things have always been this way and no one questions the arrangement....until the flood. Now everyone has been forced inland and altogether for the very first time. Co-existing proves challenging, and to make matters worse The Ill Wind that Brings No Good has arrived to spread fear and finger-pointing. However, as circumstances force Fish and Bird to work together, each begins to wonder: Is it possible our differences might turn out to be our greatest strength? As our story unfolds, students are encouraged to consider the value of new perspectives, and how each of us can benefit when we respect and celebrate diversity. Based on Hans Christian Andersen’s beloved tale of a vain Emperor and his humbling lesson, this story-ballet is charmingly narrated, and features athletic classical ballet and colorful costumes. The lively score features music from the Golden Age of Jazz, and presents an opportunity for students to hear and understand how stories and music evolve as part of culture over time. 10 minute educational introduction by an engaging speaker. 40 minutes of dancing with exciting choreography and clear narration. 10 minutes question and answer time with the dancers. A classroom package with worksheets and a follow-up discussion plan are sent in advance of the presentation to maximize learning opportunities. Please contact Artistic Director Capri Aspé for dates and other details: ZarYevkaBallet@gmail.com or 250-893-7300. We are looking forward to sharing this presentation with your school! The performance of “The Man Who Danced With the Northern Lights” by the ZarYevka Ballet was very well received by our Elementary students! The learning materials sent to our school 6 weeks prior to the performance were very well prepared and helpful. The children got to experience foot stomping, hear chin music and become familiar with the history of Acadia. Capri did a great job of engaging the children right away with an introduction, and students were captivated for 40 minutes with precise and entertaining dance, complete with beautiful costumes – the Northern Light dancers especially elicited oohs & aaahs! I would highly recommend this outreach performance group to any Elementary school. This 60 minute presentation, designed to engage and inspire, offers a spell-binding story, professional dancing, and a wide variety of learning opportunities both in English and in French. Based on Baptiste Laroque’s 1923 “Legends of French Canada” a collection of Acadian folktales, this story-ballet is engagingly narrated in either English or French. Featuring classical ballet and toe-tapping Quebecois jigs and reels, students and teachers alike will be delighted by this heart-warming coming of age story where Jacques learns that a true leader is humble, kind and encouraging to those he is entrusted to care for. Please contact Capri Aspé for dates and other details: zaryevkaballet@gmail.com or 250 893 7300. A 60 minute presentation designed to inform and inspire with an engaging story, professional dancing, and learning opportunities a plenty! 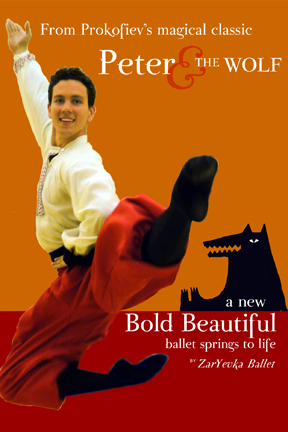 A charming new interpretation of Prokofiev's “Peter and the Wolf” this story-ballet is engagingly narrated as we follow the adventures of Peter and his friends in a heart-warming coming of age story where Peter learns the importance of friendship and being just and kind to all.